Here's a short notice that I have fixed the dates for 2 group ice climbing training seminars for the 2014 season. Seminar I: Maltatal, Austria, 09.01.2014 - 12.01.2014. This is a beginners level training from thursday evening through sunday late afternoon. Seminar II: Kandersteg, Switzerland, 13.02.2014 - 18.02.2014. This is a follow up to the first seminar. It is a intermediate level training starting on thursday morning and finishing on sunday, mid-afternoon. You should plan on a wednesday evening arrival time. I will post more details on the blog and in the outdoor section. I am also planning on having day events as the ice conditions warrant in the Salzburg area. Just use the contact form on the right if you need more information. I will only be able to accommodate 4-5 persons in each seminar. 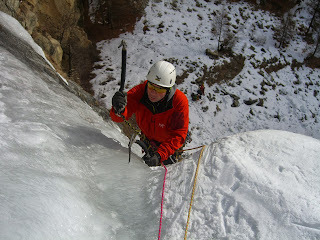 Let's hope for a great ice season in 2014!